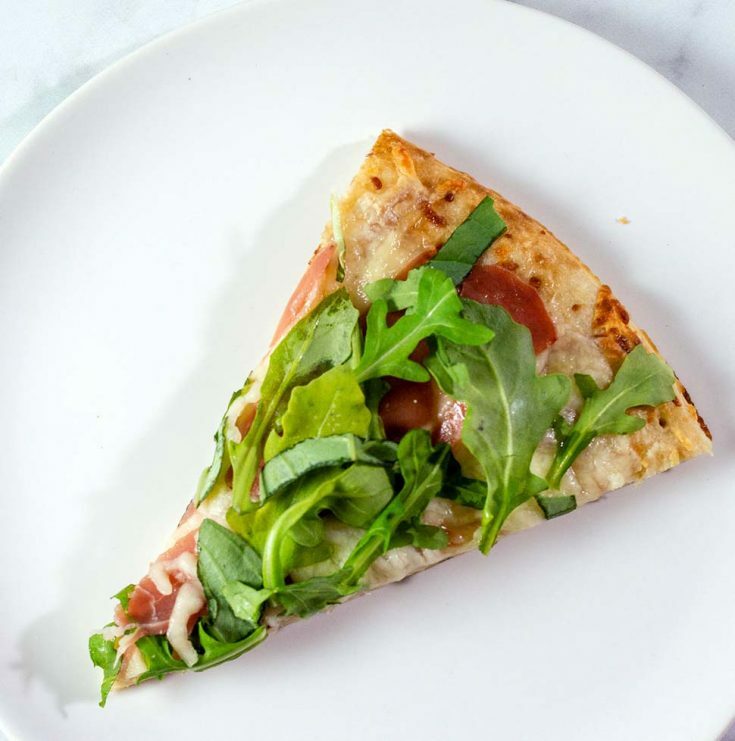 Thin-crust white pizza with mozzarella, prosciutto and arugula feels like a gourmet meal that’s easy to make right at home. Did you know that October is National Pizza Month? We have a standing Pizza Friday meal at our house. Sometimes we order in. Sometimes we eat out. Sometimes I make the pizza at home. 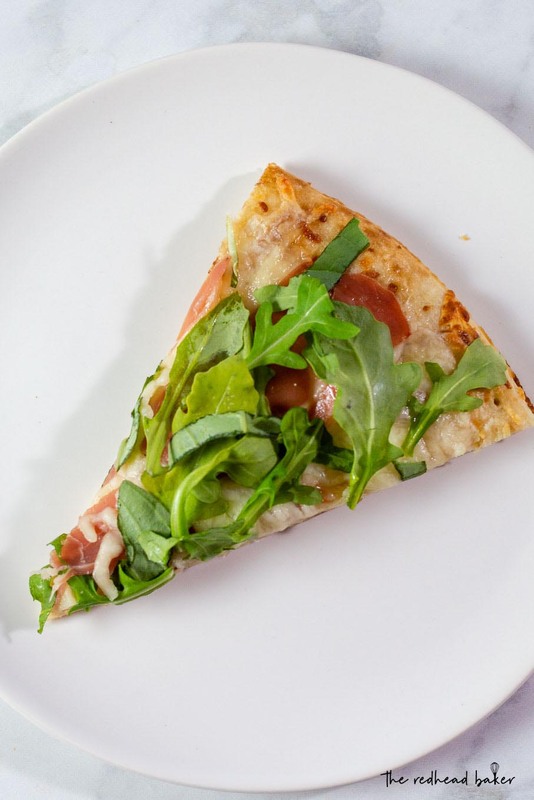 We recently tried out a new-to-us pizza restaurant, and I tried their prosciutto pizza with arugula. I wasn’t sure I was going to like it, because I’ve never been a big fan of the peppery taste of arugula in salads. But when that flavor is paired with salty prosciutto, it tastes fantastic! 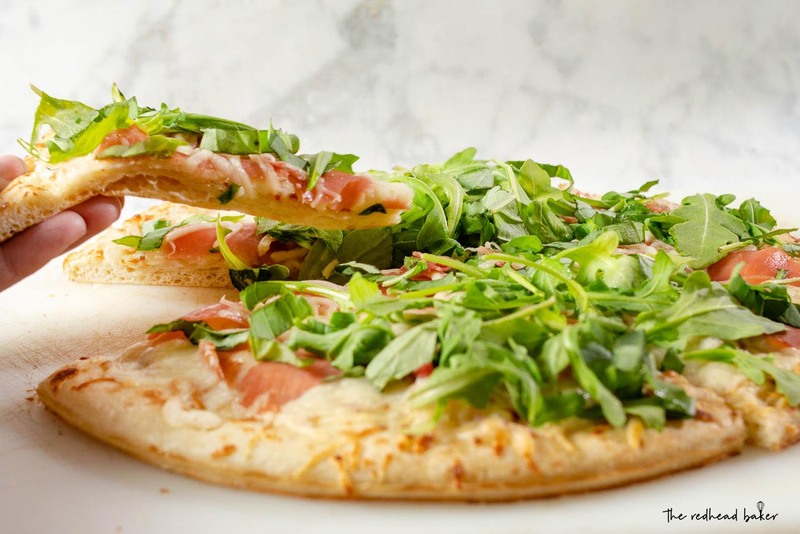 I love this topping on a thin-but-not-crispy pizza crust, although I think a crispy thin-crust pizza would suit these toppings well, too, if you prefer that sort of crust. I have a favorite pizza crust recipe, but feel free to use your preferred recipe, buy pre-made pizza dough, or even a pre-baked pizza crust. If you’re not familiar with arugula, as I said, it has a bite to it, with a mild peppery flavor. It’s usually sold in bags near the bagged salad in your grocer’s produce section. To help temper the flavor of the arugula, I also tossed some basil with the arugula before adding it to the pizza. It really helps to bake the pizza (any homemade pizza) on a pizza stone to recreate the ovens of a pizza restaurant. Preheat the stone with your pizza. When you place the pizza on the hot stone, it immediately starts cooking the pizza from the bottom, as well as the ambient heat from the oven cooking it from the top and sides, resulting in a fully, evenly-cooked crust. So, if you’re tired of the same old pizza toppings from take-out pizza places, give this white pizza a try. It’s like eating a gourmet pizza in the comfort of your own home! 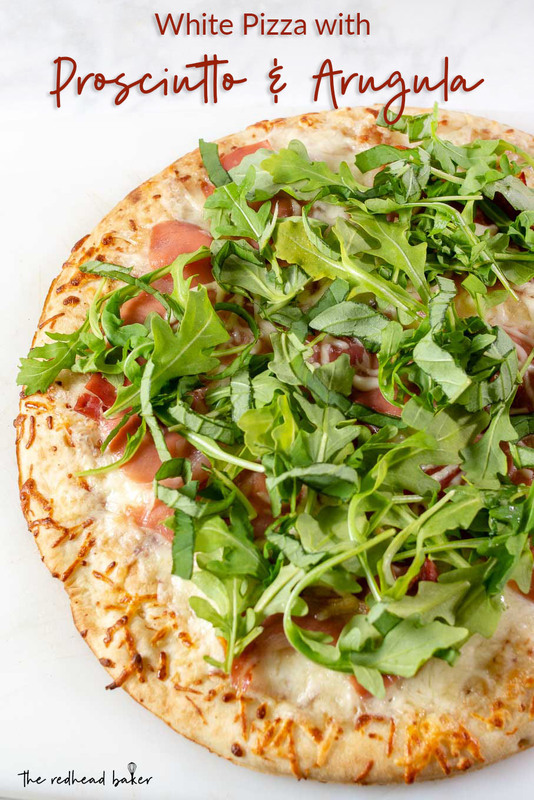 Thin-crust white pizza with prosciutto and arugula feels like a gourmet meal that's easy to make right at home. Want to make your own pizza dough? Try this recipe! On a pizza peel sprinkled with cornmeal, stretch the pizza dough to 12 inches in diameter. Brush the olive oil over the entire crust. Sprinkle with the garlic powder. 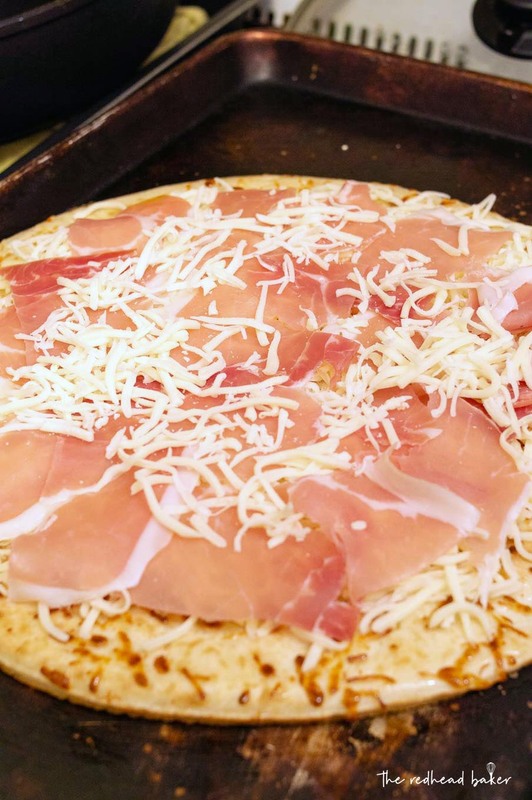 Spread the mozzarella in an even layer over the crust, then top with the prosciutto. Bake for 16 minutes, until the crust is baked through and the cheese is bubbly. Remove the pizza from the oven. Spread the arugula and basil over the pizza. **If using store-bought pre-baked crust, bake on a baking sheet (not a pizza stone) for only for 8 to 10 minutes. This sounds delicious Coleen. I love arugula. I just recently made a pizza with arugula and loved it. As you say, it goes so well with all of salty toppings.